Shown with optional nichos (niches) and banco (benches). 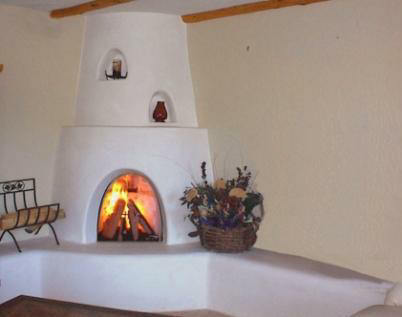 Nothing reflects the Native American charm more distinctly than the classic design of the "Sandia" style kiva fireplace. This fireplace can be as small as 3' wide (without banco) or as large as you desire. The "Sandia" as shown here, has an optional banco installed on the side, and nichos on the top. These options can be added to any style. The hand laid firebrick in the firebox highlights the authentic styling of the fireplace which can burn either wood or gas logs. The frame may be extended or lowered to accommodate various ceiling heights.